When you think of the U.S. Census Bureau, you probably think of surveys and statistics. But did you know that geography is also a big part of our work? Geography plays an important role in creating surveys and collecting data, and it provides meaning and context for our statistics. The Census Bureau conducts research on geographic and address topics, makes reference maps to support censuses and surveys, and creates tools to visualize geographic and statistical data. The Census Bureau’s history of mapping population data dates back to the 1860s. 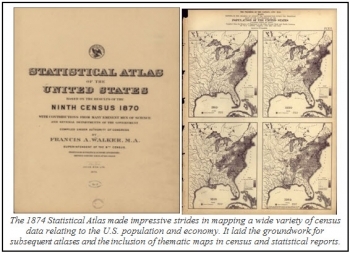 Under the direction of Census Superintendent Francis Amasa Walker and Chief Geographer Henry Gannett, the Bureau produced the Statistical Atlas of the United States, a landmark publication that contained innovative data visualization and mapping techniques. A century later, the Census Bureau was a leader in the early development of computer mapping. In the 1970s, James Corbett of the Statistical Research Division devised a system of map topology that assured correct geographic relationships. His system provided a mathematical base for most future Geographic Information Systems (GIS) work and helped spark the development of computer cartography. However, at that time, the Census Bureau still relied heavily on paper maps. Census Bureau geographers and cartographers used some computer-scanned mapping files, covering about 280 metropolitan areas, to create paper maps for enumerators to use. For the rest of the nation, paper maps came from a variety of sources, varied in quality and scale, and were quickly outdated.